For courses in Hospitality Marketing, Tourism Marketing, Restaurant Marketing, or Hotel Marketing. Marketing for Hospitality and Tourism, 7/e is the definitive source for hospitality marketing. 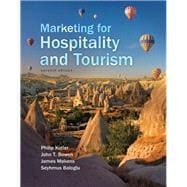 Taking an integrative approach, this highly visual, four-color book discusses hospitality marketing from a team perspective, examining each hospitality department and its role in the marketing mechanism. These best-selling authors are known as leading marketing educators and their book, a global phenomenon, is the leading resource on hospitality and tourism marketing. The Seventh Edition of this popular book includes new and updated coverage of social media, destination tourism and other current industry trends, authentic industry cases, and hands-on application activities. Philip Kotler is S.C. Johnson & Son Distinguished Professor of International Marketing at the Kellogg School of Management, Northwestern University. He received his master's degree at the University of Chicago and his PhD at M.l.T., both in economics. Dr. Kotler is the author of Marketing Management (Pearson), now in its fifteenth edition and the most widely used marketing textbook in graduate schools of business worldwide. He has authored dozens of other successful books and has written more than 100 articles in leading journals. He is the only three-time winner of the coveted Alpha Kappa Psi award for the best annual article in the Journal of Marketing. Professor Kotler was named the first recipient of four major awards: the Distinguished Marketing Educator of the Year Award and the William L. Wilkie "Marketing for a Better World" Award, both given by the American Marketing Association; the Philip Kotler Award for Excellence in Health Care Marketing presented by the Academy for Health Care Services Marketing; and the Sheth Foundation Medal for Exceptional Contribution to Marketing Scholarship and Practice. His numerous other major honors include the Sales and Marketing Executives International Marketing Educator of tile Year Award; The European Association of Marketing Consultants and Trainers Marketing Excellence Award; the Charles Coolidge Parlin Marketing Research Award; and the Paul D. Converse Award, given by the American Marketing Association to honor "outstanding contributions to science in marketing." A recent Forbes survey ranks Professor Kotler in the top 10 of the world's most influential business thinkers. And in a recent Financial Times poll of 1,000 senior executives across the world, Professor Kotler was ranked as the fourth "most influential business writer/guru "of the twenty-first century. John T. Bowen is Professor and former dean of the Conrad N. Hilton College of Hotel and Restaurant Management at the University of Houston and the Barron Hilton Distinguished Chair. Professor Bowen has presented marketing courses and seminars in Asia, Australia, Central America, Europe, and South America. Dr. Bowen is a consultant to both large and small hospitality corporations. Before becoming an academic, Professor Bowen held positions in restaurant management at both the unit and corporate level. Professor Bowen is on the editorial boards of the Cornell Hotel and Restaurant Administration Quarterly, Journal of Services Marketing, International Journal of Contemporary Hospitality Marketing and Worldwide Hospitality and Tourism Themes. He is co-author of Restaurant Marketing for Owners and Managers. Professor Bowen has received numerous awards for his teaching and research, including the UNLV Foundation Teaching Award, the Sam and Mary Boyd Distinguished Professor Award for Teaching, Founder’s Award for Lifetime Support of Hospitality Graduate Education, and the Board of Regents Outstanding Faculty Member. The Graduate Education & Graduate Student Research Conference presented him with the Founder’s Award, to recognize his contribution to graduate education. The Hotel and Lodging Association of Greater Houston recognized him with their lifetime achievement award. He has been a three-time recipient of the annual award from the International Council on Hotel, Restaurant and Institutional Education (CHRIE) for superior published research in the hospitality industry, and he received the John Wiley Award for Lifetime Research Achievement from CHRIE. Professor Bowen was recently cited as one of the five most influential hospitality management faculty in an article published in the Journal of Hospitality and Tourism Education. The Mayor of Houston proclaimed November 21, 2014 as John Bowen Day, in recognition of Dr. Bowen’s contribution to the hospitality industry and hospitality education. Dr. Bowen’s formal education includes a B.S. in hotel administration from Cornell University, an M.B.A. and M.S. from Corpus Christi State University, and a Ph.D. in marketing from Texas A&M University. James C. Makens is actively involved with the travel industry. He has conducted executive training for the Sheraton Corporation, Regent International Hotels, Taiwan Hotel Association, and Travelodge of Australia. He has also conducted marketing seminars for tourism ministries or travel associations in Australia, New Zealand, Canada, Indonesia, Singapore, Malaysia, and many nations of Latin America. Dr. Makens serves as a consultant and has written marketing plans for travel industry companies and tourism promotion boards. Other books he has authored or co-authored include The Travel Industry and the Hotel Sales and Marketing Planbook. His professional articles have appeared in the Cornell Hotel and Restaurant Administration Quarterly, Journal of Travel Research, Journal of Marketing, Journal of Marketing Research, and Journal of Applied Psychology. Dr. Makens earned an M.S., an M.B.A., and a Ph.D. from Michigan State University. He holds a B.S. from Colorado State University. He served as associate dean in the School of Travel Industry Management of the University of Hawaii. He was also an associate dean of INCAE, an affiliate of the Harvard Business School in Central America. Dr. Makens recently retired from the faculty at The Babcock Graduate School of Management at Wake Forest University. Seyhmus Baloglu is professor and Harrah Distinguished Chair at the William F. Harrah College of Hotel Administration, University of Nevada Las Vegas (UNLV). He earned a B.S. in hotel administration from Cukurova University, an M.B.A. from Hawaii Pacific University, and a Ph. D. in hospitality marketing from Virginia Tech. Professor Baloglu has presented marketing courses and seminars in Asia, Australia, Europe, and the Caribbean. Before joining academia, he held management positions and had diverse background and in the industry including restaurants, hotels, resort clubs and travel agencies. Professor Baloglu has published extensively in leading journals, including Journal of Business Research, Cornell Hospitality Quarterly, Journal of Hospitality & Tourism Research, International Journal of Hospitality Management, Annals of Tourism Research, Journal of Travel Research, Tourism Management, Journal of Travel & Tourism Marketing, and Tourism Analysis. He received grants, contracts, and consulting projects from tourism destinations, gaming resorts, hotels, airports, nightclubs, and supply chain organizations. He has been named as one of the significant contributors to the hospitality and tourism literature. His work has been cited extensively across multiple disciplines and fields. His research credentials have earned him both an international reputation and placement on the editorial boards of numerous leading journals. He has presented his work at many national and international conferences, seminars, and symposia, and served as keynote speaker and panel participant for numerous international conferences. Other books he has coauthored are Managing and Marketing Tourist Destinations: Strategies to Gain a Competitive Edge and Handbook of Scales in Tourism and Hospitality Research. Professor Baloglu is the recipient of numerous and prestigious teaching, research, and service awards. He has been named as the recipient of UNLV Alumni Association's Outstanding Faculty Member of the Year and the John Wiley & Sons Lifetime Research Achievement Award from the International Council on Hotel, Restaurant and Institutional Education (ICHRIE). His other major honors include annual research awards from ICHRIE, the Sam and Mary Boyd Distinguished Professor Awards, the Ace Denken Research Award, and the Claudine Williams Distinguished Chair.